Free S/H on Air-Pro orders over $99! 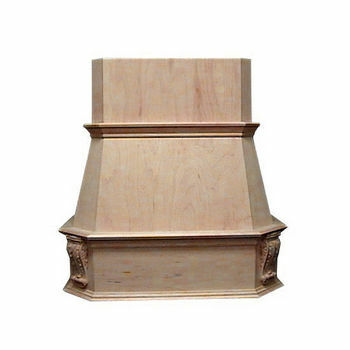 This Air-Pro Victorian Wall Mount Range Hood features corbels on each side of the hood. The high-end style and quality of this range hood make it the perfect addition to any kitchen. The hood is constructed from any of three different quality hardwoods including Red Oak, Maple, Hickory and Cherry. The woods are unfinished so your range hood can be painted or stained to match your kitchen cabinets or range. This range hood is available in 36”, 42” and 48” widths to accommodate most range sizes. Re-circulating ductwork kits are also available. Very pleased with the vent hood! Great quality and careful shipping!